Of all the things not likely to take place at this election (an ever-increasing list including a majority government, a surge for Ukip, gains by the Lib Dems and a second MP for the Greens), a record-breaking national swing is perhaps the most unlikely of all. 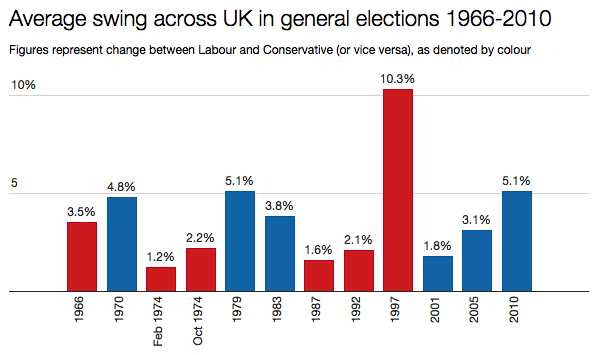 It will be a very long time before any party comes close to even matching the 10.3% swing achieved by Labour in 1997. I doubt we’ll also see anything near the swings of around 5% that took place in 1970, 1979 and 2010. A swing on 7 May from Conservative to Labour in England and Wales of around 3% would hand Ed Miliband roughly 40 seats. A swing of 2% would deliver around 26. Just 1% would mean 13. Recent opinion polls have tended to suggest a swing in England and Wales of anything between 3 and 5%. If Labour did manage a uniform swing of a high as 5%, 59 Tory seats could potentially change hands. Those figures in the above graph are for the average swing across the whole country. But there will be no net positive swing to Labour in Scotland this year. For the first time in a UK general election, Scotland will have to be treated as an entirely separate calculation, as any swing between Labour and the Tories will be largely meaningless. The swing that matters will be from Labour to the SNP – and here we could see something record-breaking. We may even get a swing in one or two individual seats that tops the 2010 record of 21.8%, set by the Liberal Democrats in Redcar. But Labour could also set a record of sorts if it manages to defeat Nick Clegg in Sheffield Hallam. To do so would require a swing of at least 19.7%: the largest the party has ever achieved in a single seat at a general election for at least half a century. Strictly speaking the biggest swing in the country is likely to be in Clacton, since swings are generally measured from the previous general election and not any subsequent by-elections. If you discount Clacton (and also Rochester & Strood and Bradford West which fall into a similar category), then I’d put my money on Kircaldy & Cowdenbeath having the largest swing. Like Alex I think there will be large swings in Bradford W and Clacton due to the by election effect. There will also be large LD/Lab swings in Bristol W Brent C and Redcar. Everyone knows there will be many large Lab/SNP swings all over Scotland. I believe it was Brent Central where the Lib Dem candidate was deselected after it emerged he had pocketed a donor’s gift for himself rather than reporting it to Lib Dem central office. Might increase the swing a little there.